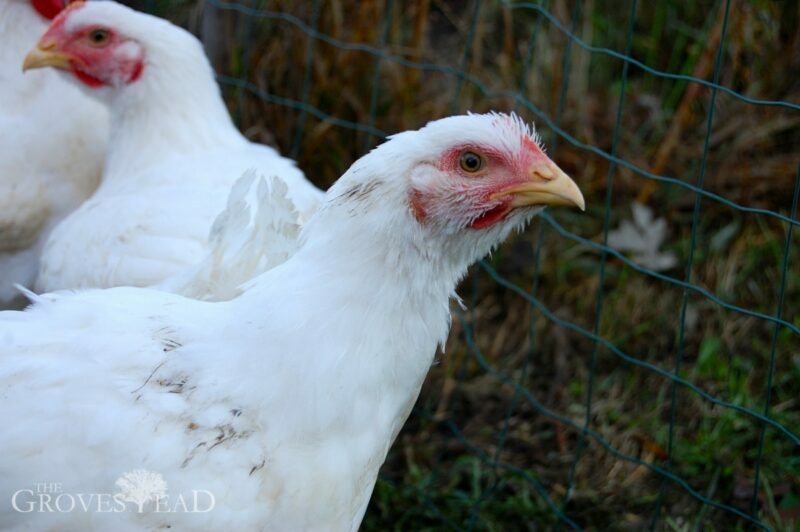 It wasn’t until mid-summer that I made up my mind to try raising meat chickens this year. Our good friends Jen and Ben were visiting from Montana and I was laying out my case. We have the freezer space, and we certainly have the land. But the garden, raised beds, apple trees, and blueberry patches were already spreading me thin. Could I handle the extra work? At the end of the conversation I decided yes. We live in Minnesota, after all, where Summer lasts about two months. If I didn’t do it now, I’d have to wait 8 months before I could try again. So I called a hatchery and placed my order. The chickens arrived in the mail a few weeks later. 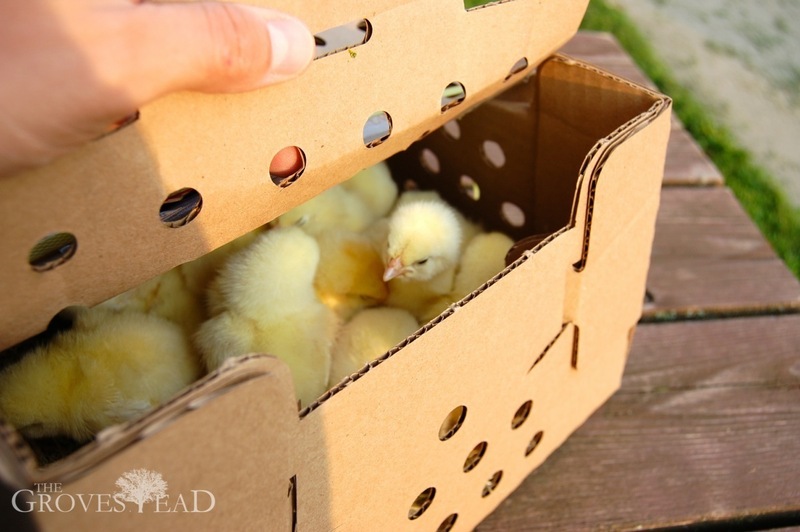 Before they arrived, however, I had to build a coop to house them overnight. 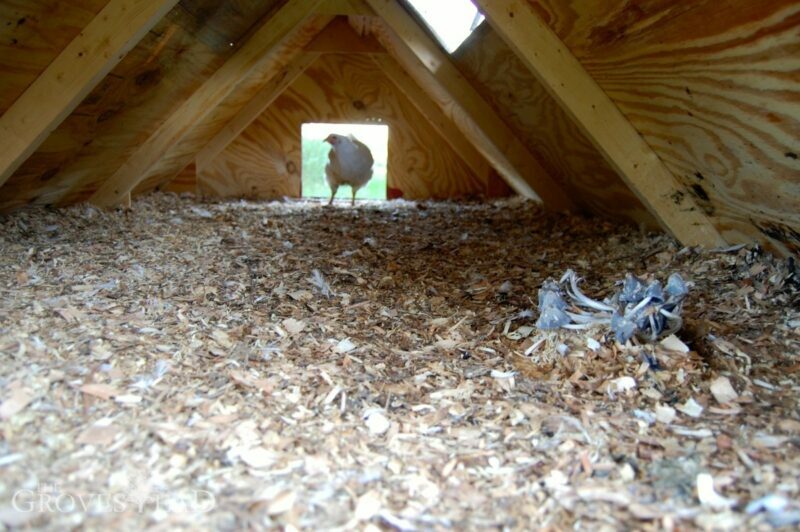 Not locking your birds up at night is the fastest way to lose your chickens (and feed the local wildlife). “How do you get them to go into the coop at night?” is one of the most common questions I get about raising chickens. Actually, I don’t do anything. 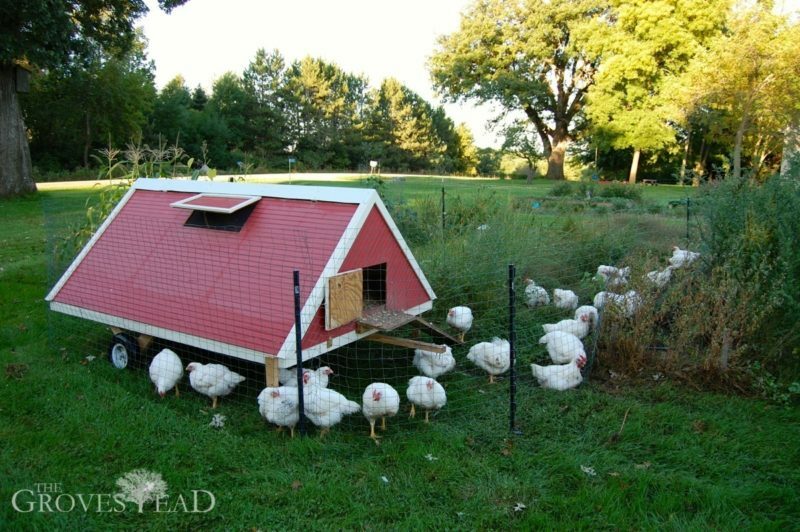 As soon as the sun sets, they instinctively seek out the shelter of their coop. I just shut the door around 9pm each night and open it again in the morning. 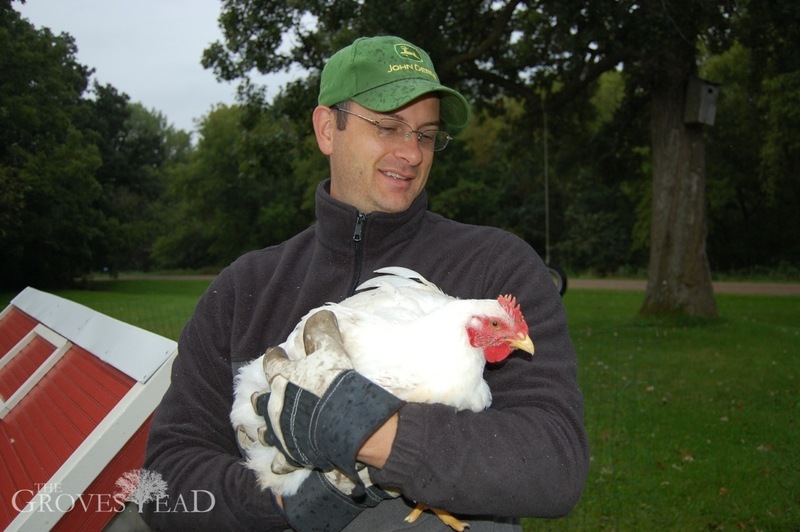 Caring for the meat chickens was a lot more work than our laying hens. There were a lot more of them for one thing–30 compared to 6. And this breed in particular, Cornish Cross, eats a ton and grows like crazy. By the last week they were eating 20 lbs of feed and drinking 5 gallons of water every day. 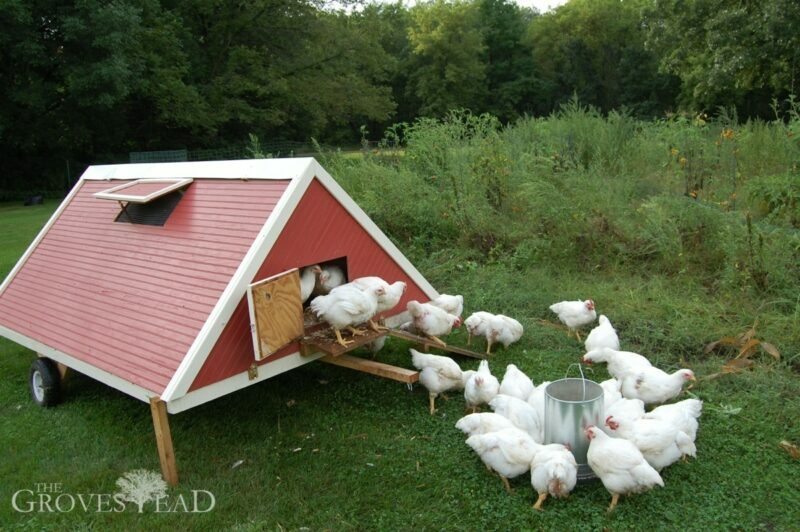 As they got bigger, they made quite the “mess” in their coop each night. So I also spread a layer of clean pine shavings daily. It’s not a ton of work, maybe about 15 minutes a day. But it gets repetitive after 10 weeks. One particularly hot and humid day I opened the coop to find that mushrooms had sprouted from the now-composting wood shavings. The real chore was moving the coop. 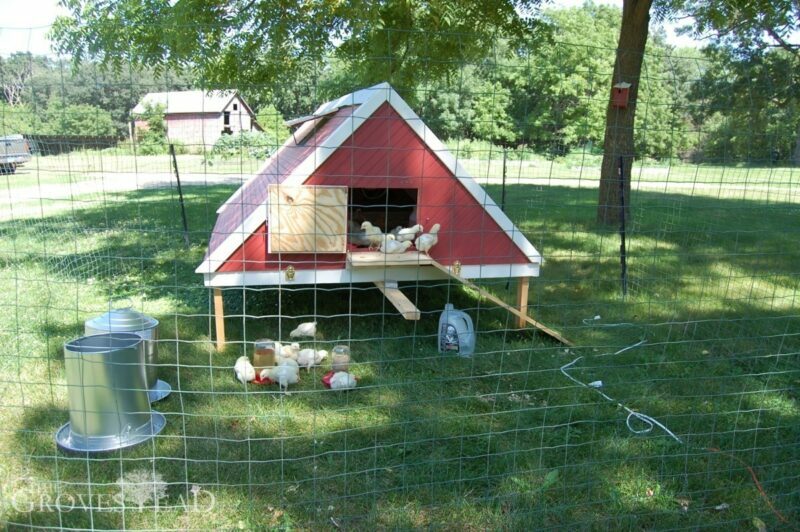 I decided to build a mobile chicken coop so I could move the birds around to different parts of the yard and garden. Leaving them in one place too long reduces the vegetation to dirt and is generally unclean. I wanted them to have fresh food but also be protected from predators inside a fence. I also wanted them to scratch and fertilize my garden plot after I finished harvesting (which they did). 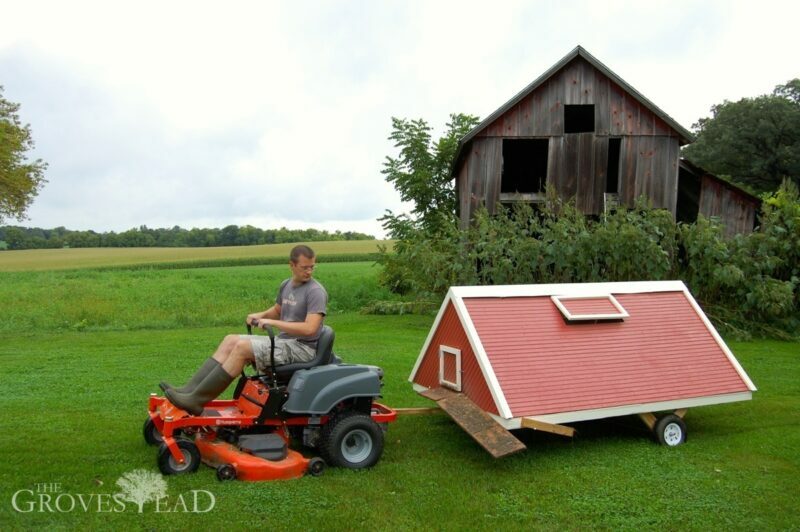 So hitching my riding lawnmower to the coop, I dragged it to a new location about once a week. 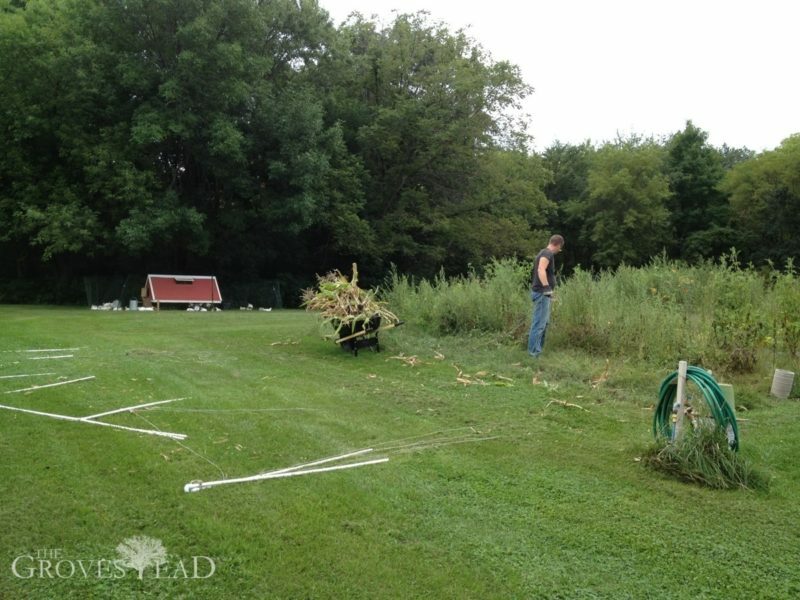 Then I coiled up the welded wire fence and repositioned it around the coop. We started out buying feed from Mills Fleet Farm but found it cheaper at a feed supply store. 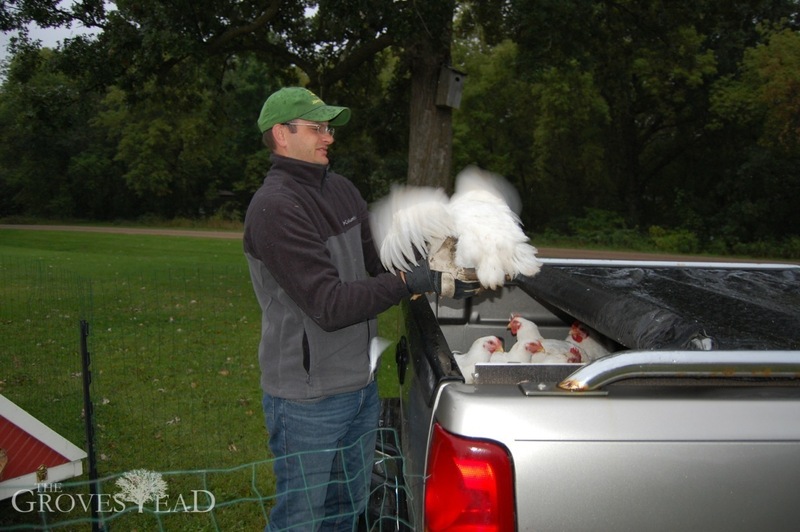 We ended up buying about 12 50# bags of feed over the 10 weeks we raised the birds. It would have been less but there was a 2-week wait at the place we had them butchered. All told, however, the cost for buying the chicks, feeding, and butchering came to around $9 per bird. For the weight, that’s cheaper than grocery store chicken. But for free-range organic chickens, it’s a steal. 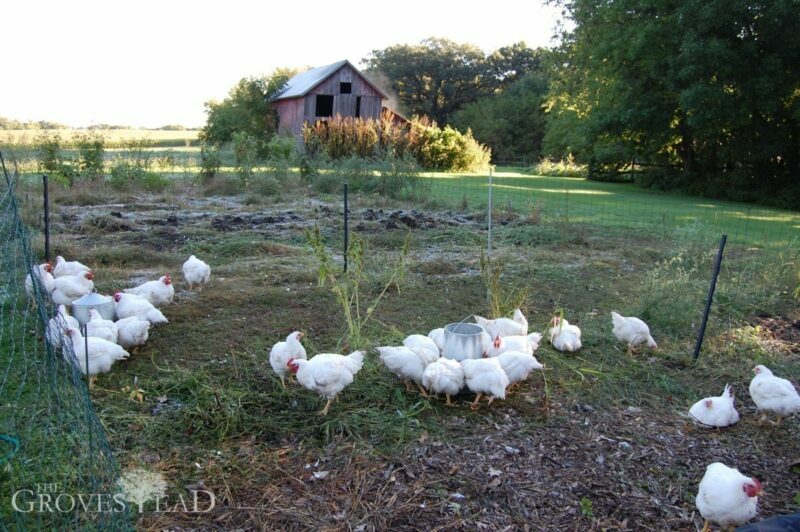 Try googling “free range organic chicken prices” and see what you find. Prices start around $20 per bird and go up from there. One farm is selling organic breast meat for $11.69 per pound! But the value goes far beyond the money. It’s about the experience. To have raised the food that feeds our family and know they were well-cared for… that’s hard to put a price on. Our last morning together was dreary. Not in the sentimental way, more in the literal sense. 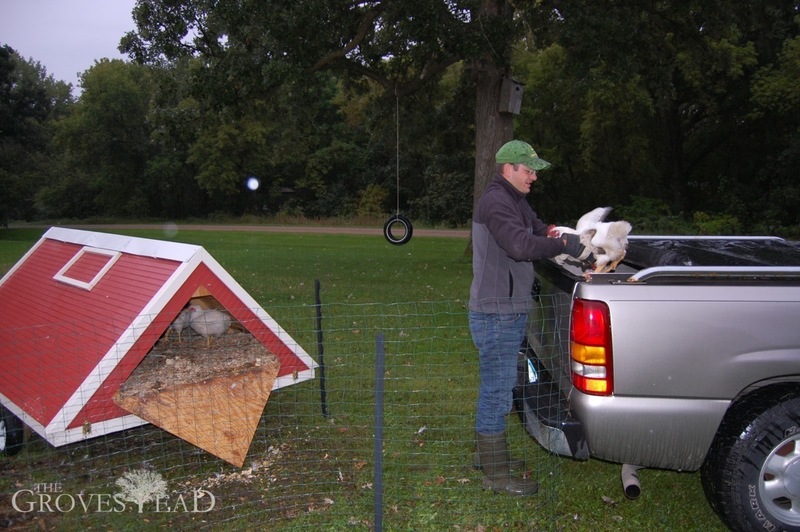 It was down pouring and I had to get 30 chickens out of a coop and into my covered truck bed. With Becca’s help I managed to get ahold of each one and load them into the pickup. Then I dropped them off at a meat locker in the next town where they were butchered. We picked them up bagged and frozen the next afternoon. We have enough chicken now in our freezer to last the winter. 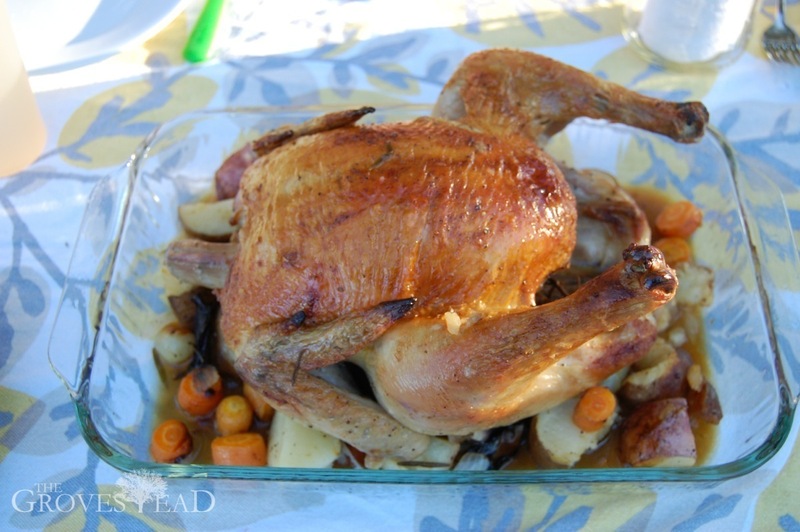 We ought to be expert poultry cooks by Spring. 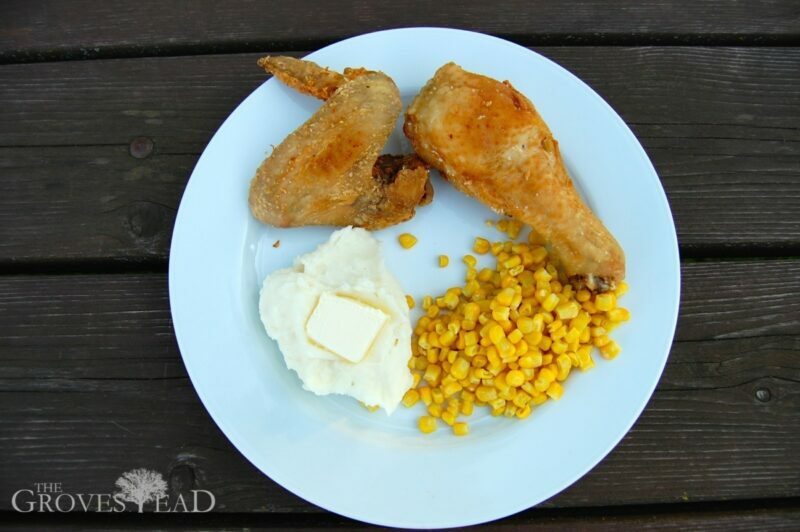 So far we have made pan-friend chicken and oven-roasted chicken with garden veggies. Both delicious meals. Our neighbor stopped over tonight while we were enjoying our roasted chicken. She had watched the birds grow week by week from infancy to gold’n’plump. “So… how does it taste?” she asked. “Happy.” I said. While it can be a bit disturbing to eat something raised by your own hands, it helps to know they lived a good life, were treated well, and as best we can tell, were very happy birds. It’s official: the growing season is over. 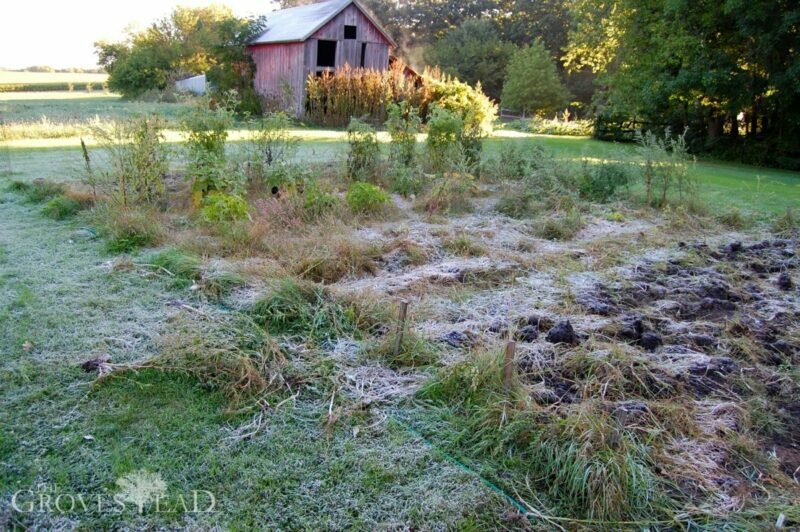 First frost arrived 3 weeks earlier than average as temperatures dropped to 34 degrees overnight last Saturday. I spent the previous afternoon plucking the remaining potatoes out of the ground (60 lbs worth). The coldest Winter in 36 years followed by a Summer-cut-short? I emailed my friend Paul Douglas to find out what was going on. His reply to my “incredulity” came in print edition of the Sunday Star Tribune. He doesn’t know either. The close of the season brings out all kinds of reflective thinking. What worked? What didn’t? What would I do differently next year? I have lots to share. But for now it’s nice to know that the heavy lifting is over, a season of rest is coming, and the planning for next year’s garden starts soon enough.